Did Detective Suiter Commit Suicide? 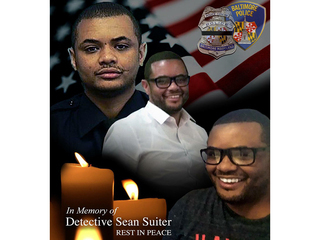 Baltimore Police Homicide Detective Sean Suiter killed himself. That was the explosive finding that came down late Tuesday afternoon when the Baltimore Police Department released the 207-page report from an Independent Review Board (IRB) . The Independent Review Board published a 207-page report detailing their investigation of the death of Detective Sean Suiter. The board's ultimate conclusion was that Suiter killed himself with his own service weapon. The IRB, commissioned by former and now federal charged Baltimore Police Commissioner Darryl De Sousa, first convened back on April 12th . On that day, the chair of the seven-member panel explained to the media what they were tasked with doing. “We are not going to re-investigate the homicide but whet we are gonna do is do an assessment on the work that has been done,” said Chair James (CHIPS) Stewart. Even so, this board did render a conclusion. After four months and 225 hours pro bono work interviewing more than 30 people, the IRB’s concluded Suiter killed himself, going against the state medical examiner who had determined the detective's death was a homicide. In the 200 plus page report, the IRB citied ballistic evidence, the autopsy and videos for how they reached their conclusion. The IRB's report was made public Tuesday, giving readers a chance to understand the evidence they reviewed and the conclusions they made. In a key piece of surveillance video, you can watch some of the last moments of Suiter's life. It is hard to see but Suiter is pacing behind a white van at the end of Bennett Place before then suddenly darting into an alley. The IRB also released Suiter’s last words in a three second radio transmission. It is unintelligible but shortly after it, Suiter was shot with his own service weapon. Police believed Suiter was overpowered by a suspect he was watching from behind that van...but the IRB says he fired two shots into the air, then took a knee, bent down and shot himself behind his right ear. In their reasoning they cite his testimony in an upcoming grand jury scheduled for the next day concerning his involvement in case with GTTF Sergeant Wayne Jenkins , Suiter’s “knowledge” of his death benefits and that he ignored several texts from his Attorney Jeremy Eldridge before the shooting. The IRB report also dives deep into the Baltimore Police Department’s investigation into Suiter’s death and the lack of an Incident Command System. The IRB report, along with video and audio was released late Tuesday evening and immediately generated many questions. The following day the chair and co-chair of the panel held a news conference at city police headquarters . The chairs of the IRB addressed the media the day after their report was released, standing by their conclusions despite discrepancies highlighted by questioning reporters. Stewart said that the video they released indicates a shooter would've only had a few seconds to disarm Suiter, shoot him, erase any evidence they were there, then flee. The board said this wasn't a ghost; a killer didn't exist. Video shows Suiter standing by an alley alone before darting in. Moments later he was dead. The report was also was very critical of former Baltimore Police Commissioner Kevin Davis for not changing the narrative after he learned that the bullet actually entered the right side of Suiter's head, contrary to what the hospital initially thought. It was that fact the board believed opened the probability of suicide, but they say Davis didn’t publicly speak about it. Instead, the IRB says the commissioner stuck with a suspect description; a heartless, ruthless, soulless killer. Panel members suggested in their report that despite other evidence, there was a stronger willingness in the department to continue to believe Suiter was murdered. “When people are emotionally involved in an issue, whether it's community members, or police officers or police leaders, it's very difficult to look at facts and accept that,” Co-Chair of the IRB James Coldren said. The current interim Commissioner Gary Tuggle has not drawn a conclusion but says this report is added to their overall investigation. At the close of the news conference, the IRB chair said that the work of the board has now concluded and there is nothing more for them to do. The next steps are up to the Baltimore Police Department and the Office of the State Medical Examiner. Suiter got a hero's send off when he was laid to rest in the fall. The last time Nicole Suiter spoke to her husband was an hour before his death. They joked about a video of him dancing, he asked when she would get home from work that night...he planned to stay up. It was an intimate detail between husband and wife, revealed by Nicole Suiter when she spoke with WMAR 2-News in her first ever interview since the death of her husband. When asked what the past few months have been like, she her pain was poignant. Sean Suiter's widow, Nicole Suiter, broke her long silence following Wednesday's IRB press conference, defending her husband's name and refuting their findings. She believes a cop killer remains on the loose. Suiter was flanked by both her attorneys and Sean's attorney Jeremy Eldridge as she read a statement she wrote Tuesday night upon hearing the Independent Review Board's finding that her husband committed suicide. She says she is not saying this as just a grieving widow, but an aware individual. Suiter points to what she says are inconsistencies and inaccuracies in the 207-page report. Chief among them is her husband's alleged connection to the Gun Trace Task Force. In the IRB report, it says convicted officer Daniel Hersl pleaded guilty in the scandal and cooperated to possibly implicate Suiter. But in fact, Daniel Hersl did not plead guilty. He did not cooperate in a plea deal and Baltimore spent most of January watching him and Marcus Taylor stand trial . It was a question WMAR 2-News Investigative Reporter Brian Kuebler put to the chair and co-chair of the IRB in Wednesday's news conference. WMAR 2 News Investigative Reporter Brian Kuebler questions the IRB chairs about their certainty after errors are pointed out in their report. But Nicole Suiter asks where does that leave her? ”It's like re-opening wounds all over again,” Suiter said. “No,“ she said lowering her head and crying. The IRB has no real authority but says this report and their factual finding of suicide should be viewed as evidence in what the Baltimore Police Department still refers to as an open case. A copy of the report has also been delivered to the state medical examiner. Nicole Suiter's attorneys say there is no new physical evidence in this report and are gearing up for a fight if in fact, any determination of Sean Suiter's death is changed. Former Baltimore Police Commissioner Kevin Davis was the target of much criticism in the IRB report. In an exclusive interview with WMAR 2 News Investigative Reporter Brian Kuebler, Davis reacted to the bombshell report . In an exclusive TV appearance with WMAR's Brian Kuebler, former Police Commissioner Kevin Davis defend his handling of the Suiter investigation and questions how the IRB arrived at their conclusions. “I believe that we are no closer today from conclusively knowing what happened than we were several months ago,“ Kevin Davis said. Davis says the conclusion by the independent review board that Sean Suiter committed suicide was irresponsible, including, the former commissioner says, their attempt at figuring out Suiter's frame of mind. A glaring hole in this report he says is spelled out in who this panel did not interview as part of their investigation. The full 207-page report can be read online. As far as some of the criticism of his own handling of the case, he does say some of it is fair. Kevin Davis freely admits his handling of locking down Harlem Park and incident command during the investigation could have been handled better, but he takes issue with the board's assertion he misled the public. Davis says he knew the day after Suiter was killed that he was scheduled to testify to a grand jury, but he defends his releasing of that information when he did choose instead to wait until after the officer's funeral. But Davis' main issue with this report is that finding of suicide. It is a conclusion he says was reached without any new evidence, obvious mistakes and glaring omissions. He says it only serves as a convenience while victimizing the Suiter family once again. With potential conflicts of interest and an implied timetable to reach a conclusion, Davis is concerned political motivations may mar the investigation and prevent the department and the city from actually reaching the truth in Suiter's death. “Well hiring a consultant, giving a consultant a financial contract, sure," Davis warned. "There is a lot of pressure to come up with a conclusion." Corey Shegda contributed to this report. Davis has kept a low profile since his dismissal from the department in January. But he sat down with WMAR's 2 News Investigative Reporter Brian Kuebler to discuss the IRB's report.